Keep 'Em On The Road! John & Teresa Miller have a 'thing' for Corvairs. Welcome to the affordable vintage car. Almost 2 million were made, gas mileage is good. 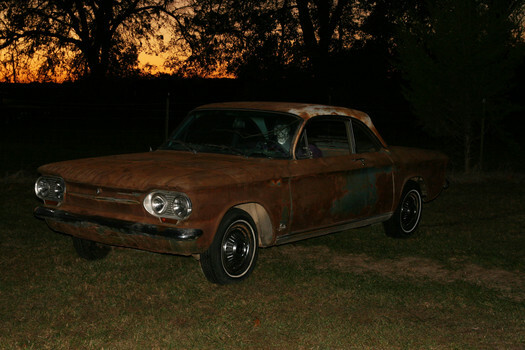 developed in the 10 years Chevy produced Corvairs. The only car proven safe on US highways in a court of law. All Electric car? 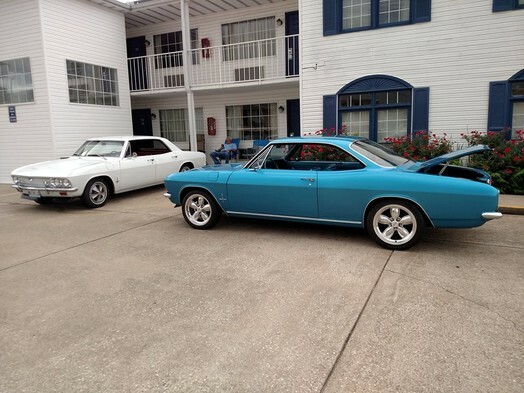 Corvair did it better than Volt 50 yrs ago. Oh, we've been here before! A true rescue, the 1961 Rampside truck has changed hands a few times without anyone reviving it. Well, the buck stops here...or at least the rescue STARTS here! 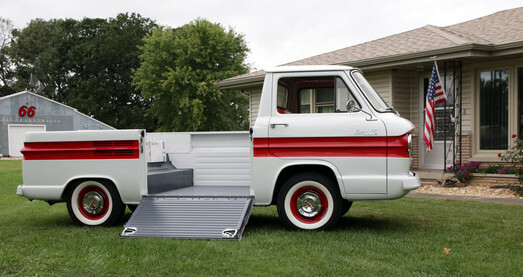 We've been asked if we "flip" Corvairs. No, not in the classic definition of the word. We don't buy them with the sale in mind. We get them because we LIKE the process and can see ourselves keeping each and every one. Well, until the barn is bursting and John gets the urge to save another one. Birmingham is the former home for this 1966 Corsa. 140hp 4 speed, power top. 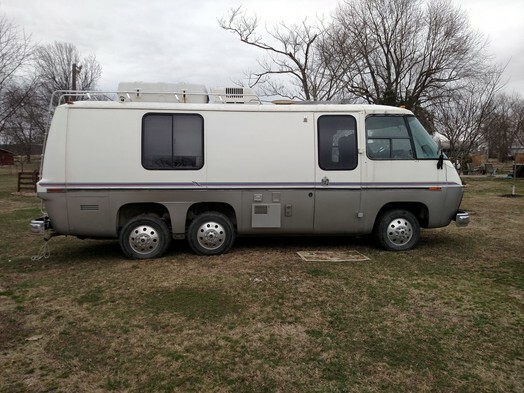 It hadn't been on the road for 12 or more years, the previous owner had it for 25. Originally black, it's made the transformation to red with a lot of the previous makeover removed and done right! on the roads by spring of 2019! Looking forward to another fabulous red convertible. It's been a while! 1967 Monza 110hp power glide automatic. 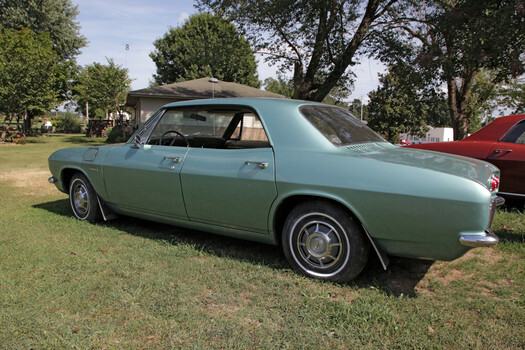 This Marina blue coupe came to us from Omaha NE with 27K miles on it in December of 2012. 2018, we turned 38K miles and it's still a joy to drive. John has changed items only when absolutely necessary. Amazing, the car still had the original exhaust, including the muffler which we just changed in 2018! interior is original other than that including the GM floor mats. It was repainted in 2013. The original paint just didn't do the car justice. 1962 Monza wagon 84hp power glide automatic. 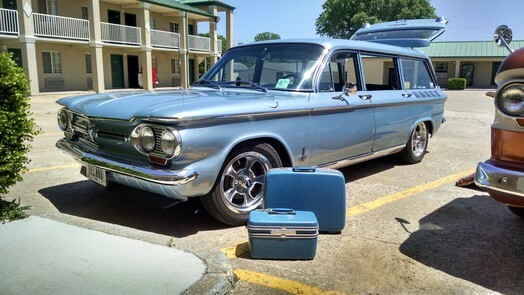 ONLY 2362 were produced for the first half of 1962, Chevy discontinued the Corvair wagon half way through the year. Clark's Corvairs is highlighted with stainless buttons. We're very pleased with the outcome. Heated seats, new stereo and the new wheels & tires, this baby IS on the road after more than 20 years in storage. 1960 Monza sedan 80 hp power glide automatic. Basically the car from the first year brochure. This is a nice older restoration. The previous owner loved using NOS parts and it shows. Down to the reproduction bias ply tires and original style roof rack. The engine was rebuilt, has about 3000 miles, purrs like a kitten. enjoying having it in the collection. 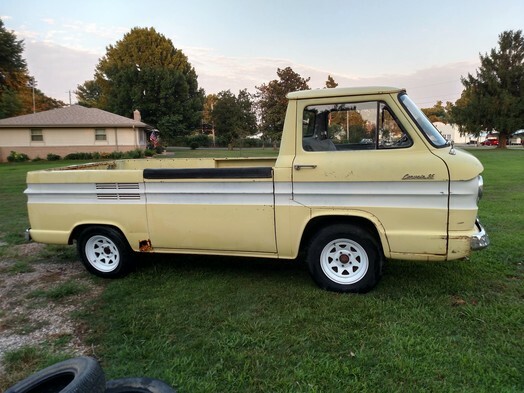 Teresa plans to use this one as her 'run around the farm' truck. the quickest Greenbrier we've ever driven. 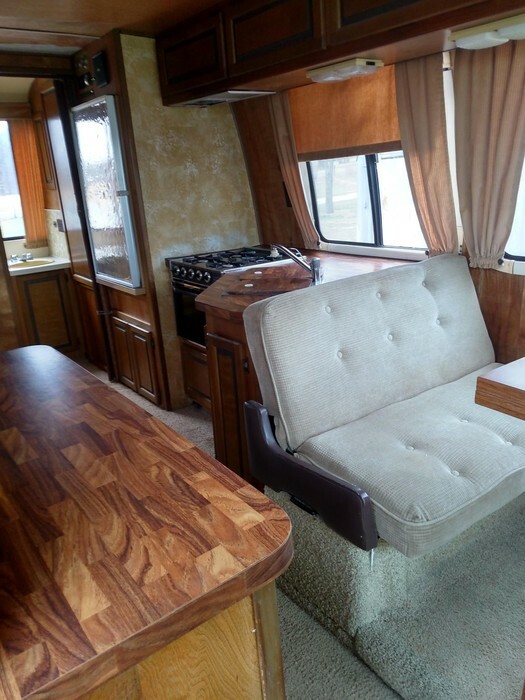 repainting the interior, as it's very original. of repainting it in the original Danube blue. Originally a line truck for Phillips 66 in Oklahoma. train is the original 80hp 3 speed. Runs and drives well. A deluxe truck, it was ordered with painted bumpers. 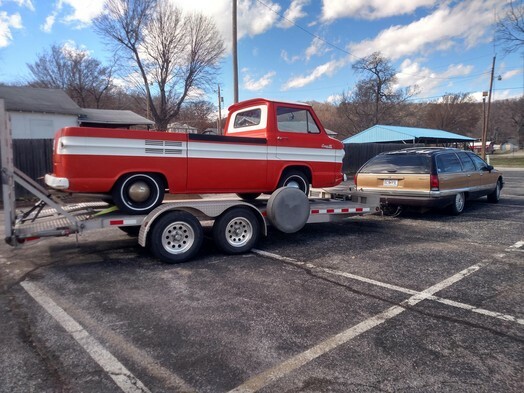 John felt this truck should return to the original configuration per the data tag. Where we appreciate all restorations, sometimes it's appropriate to put the truck back to the colors it was 'born' with. 1966 Monza 4 door hard top 110hp powerglide automatic. It has been nice to get a car we haven't had to do a full restoration . it was sold as an SS, or Sport Sedan. They were made from 1965-67.
project car...an engine switch is in its future. *this is a project we would like to find a new home for. 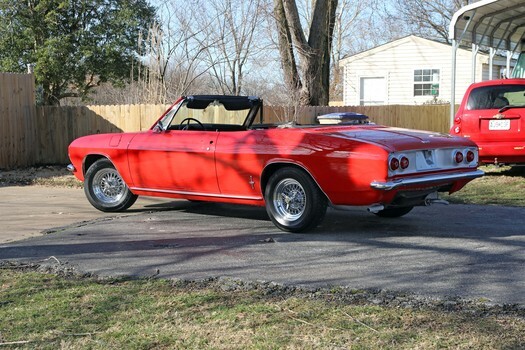 NOT a corvair, we know. 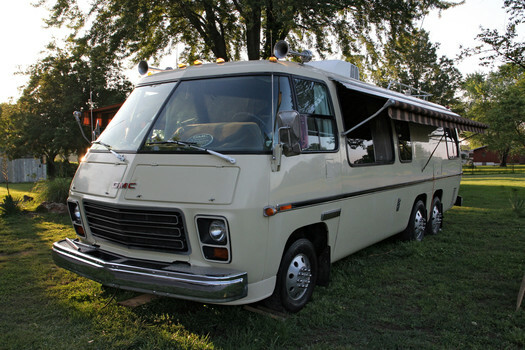 The 1975 GMC Eleganza II motorhome will become our home away from home, our Corvair transport vehicle and fits right into our 'groove' for classic vehicles. 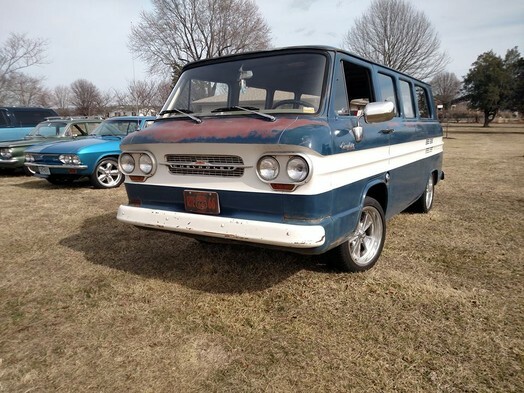 A direct descendant of the Corvair Ultra Van, the GMC sports a lot more power, a lot more space and there is a dynamic 'cult' following. GMCMI is an international organization so dedicated that they Rally twice a year. Built from 1973 to 1978, we're excited to have the coach in the collection. Coachman Industries as a transmode and outfitted with the customized interior, an upgrade from the completely GM built units. This one is in project mode, not all that far from being driveable. 2019 will be the year we finish it out or find someone who'd love a delightful project. 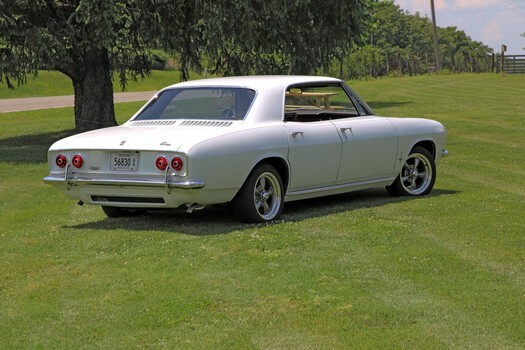 Another for the "non Corvair" category. Then again, ours isn't a "for sale" website. Hobby people, rescue is mostly what we do. Find cool things and enjoy them until we're ready to let go and find something different. 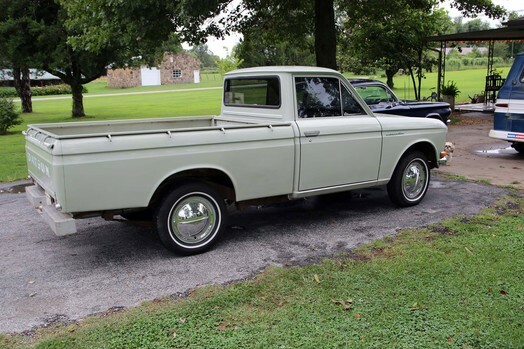 Different is this 1968 Datsun pickup. Been saying I dig these for a few years but they're usually all rusted out. Found this one near Webb city. It's original, runs and drives just fine. Neither fast OR furious, we like having this little truck around. In the category YARD ART, it's here for the enjoyment of the tourists. It is amazing how many times this car has been photographed in the past couple years! 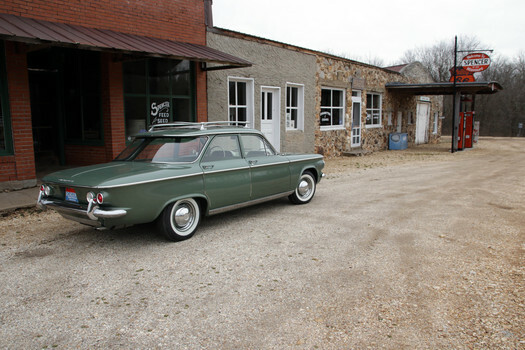 We don't leave our good Corvairs outside, so it's fun to have one that is available for those tourist "kodak moments"